Perth temperatures have spiked recently, which means we’re well on our way to summer! The sultry conditions have brought a drop in rainfall too, and with most parts of Perth having sandy soil there’s no much chance of your garden retaining a lot of water. Garden beds will need a good layer of protection at this time to reduce evaporation and give plants a fighting chance over the warmer weather. In other words, it’s time to mulch! Mulch is a simple, affordable way to keep your garden healthy and green over the summer months. It helps to insulate the soil by acting as a natural buffer against the elements (such as the sun, wind and rain) while assisting the retention of water to keep your plants’ delicate root systems nice and moist. Mulch is essentially any organic material that is spread on top of the soil to act as a natural protective barrier – a little like the sunscreen we apply to our bare skin. It can be made from grass clippings, leaves or straw. In Australia however, the most popular type of mulch is wood-chips. There are an enormous range of mulching products on the market, available everywhere from boutique nurseries to the local supermarket. At Wanda’s, we only use sustainable mulch that is sourced locally. Our product is a high grade mulch and naturally attractive. You won’t find stray bits and pieces of unknowns in our mulch, and this mulch allows the water to penetrate to your plant roots and protects the microbiology of your soil. However, not all mulch is created equal and you will be able to find cheap mulch on the market. 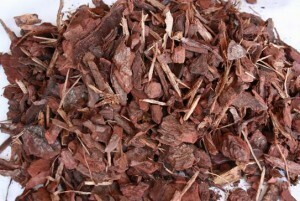 This mulch is usually not of the same high quality and not uniform in colour or size. We can supply a cheaper lower grade mulch if appearance is not a deciding factor (available on request). If you are sourcing your own mulch ask the supplier if it is artificially dyed. Dyed mulch is not environmentally sustainable and the black mulch with peat falls into this category. It looks good initially and you will usually see it on homes that are listed for sale as it gives an instant face lift to a property. However it absorbs the heat and effectively cooks your precious plants, whilst killing the microbes within the soil. Black mulch does not allow the water to flow through it to the plant roots where needed, instead it soaks up the water like a sponge. 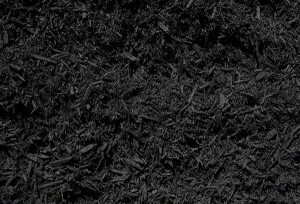 Many people are unaware of the negative effects this black mulch has on their garden. Wanda’s recommends the use of sustainable mulches. Mulch is a great way to help keep the weeds at bay. It acts as a natural barrier, preventing light from getting to the weed seeds, which in turn stops them from germinating. Who needs weed killer when you have a good covering of mulch?! Mulch insulates the soil, acting as a natural buffer against the elements. It will keep it cool in the hotter months, effectively shading it and preventing it from drying out under the blazing sun. By insulating the soil, this will help it retain water to keep your plants’ root systems nice and moist. It will also drastically helps to reduce the amount of water you need, making it an extremely affordable and sustainable way of saving water. Mulch is light enough to not compact the soil underneath, which allows the soil to be able to breathe. Mulch is an affordable way to keep your garden beds looking attractive and uniform, while performing an essential function in the garden. For more information about mulch and how it can effectively protect your garden, talk to the team at Wanda’s today on 9450 6165. Or complete our customer contact form here. Black Mulch is dyed and not a great choice.